In the event of sudden outburst or sudden release or flow of the river no harms can happen- Kiren Rijiju. In the event of sudden outburst or sudden release or flow of the river no harms can happen, said Union minister of state Kiren Rijiju, He was talking with the Media in Itanagar. 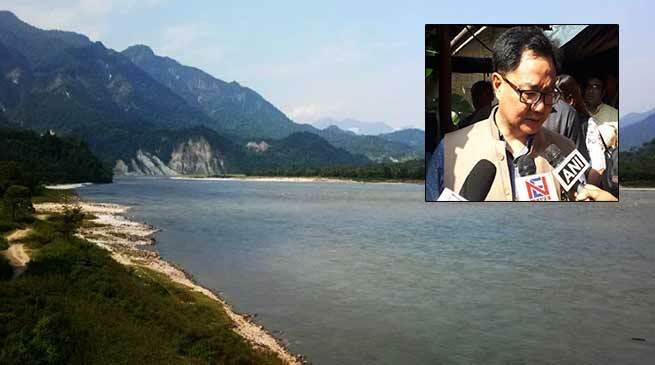 Siang river is a very big river, when there are same natural calamities or some type of earth quakes, or land slide, then is posses dangers to the people living in down stream, said Rijiju. Rijiju informed that ‘The Chinese govt is sharing information with the Indian authorities, and the Indian authorities also sharing the information with the district administration in the Siang belt. All the precautionary measure are being taken’ . There is huge land slide and blockaded in the normal course of river flow, so there is also some disturbance in the course of normal flow of Siang river. But all precautions are being taken, district administration is keeping everything on track and advised the people not to venture out on the river bank for fishing or other thing. In the event of sudden outburst or sudden release or flow of the river no harms can happen, said Rijiju.